The Violet Linen 'Sapphire' embroidered tablecloth will help you dress up dinner - or any other event - with its unique and appealing design. The sapphire embroidered design collection will leave a fantastic impression on friends and visitors. This table cloth is everything I was hoping it would be, with the cut out details and the scalloped edges. It is a lighter material which I was looking for but durable. It is a table cloth that I intend on using on my table everyday as a beautiful focal point and also to keep the wooden top protected at the same time. So pleased and happy I made this purchase. It was a steel at the price I got it at. Gave it as a gift. They used it for the holidays and got lots of compliments. Had to put another plain clothe underneath so that the table pads did not show through because of the cut out design. If you don't use pads on your table and don't mind the wood being unprotected, it is perfect. 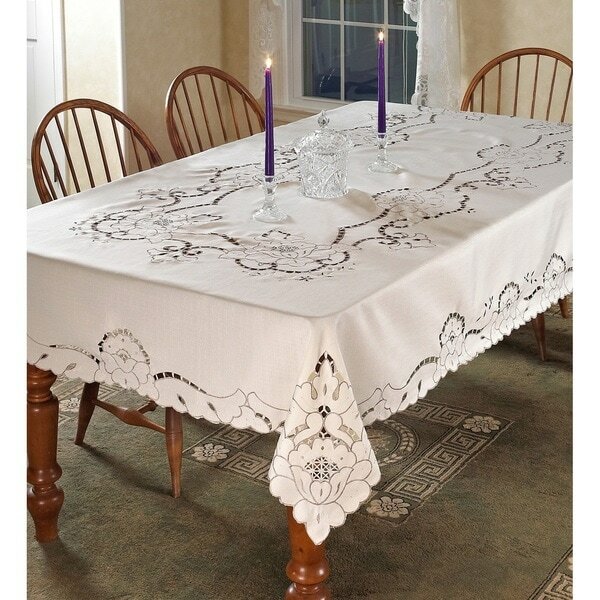 This tablecloth adds some old-fashioned sophistication to our dining room table. We use it when we have dinner guests and family because it's so retro! Nice tablecloth, but it only measures 66 inches, not the 70 inches stared in the product description. My table cloth had a black stain on it and the cut outs weren't fully cut out and left over cuts you had to pull off. Love the look and style of this table cloth. It can be as formal or casual as you want. Dress it up for formal with the use of nice place mats and chargers. The design and color are exactly as expected. Love this table cloth. The tablecloth in the package looks just like the picture. The only problem, I have one that is very similar therefore, I"m returning this one. Don't let that discourage you from purchasing one. It reminds me of batten burg lace. (sp) The best thing is you don't have to spend the day ironing. Really like the homey look of this cloth My fault I forgot the measure for the leaf and will return for a larger size. This is that Sunday dinner piece that make you feel love. Love it ! Nice table cloth .this is a must. Very elegant and stylish. Not to fancy to keep on the table every day. Priced well and embroidery is very pretty. "what sizes does this cloth come in and how long for delivery"
there are several sizes, 52x70", 60" round, 70x88", 70x105", and 70x120". I recieved my tablecloth within 3 days of ordering. Hope this helps. My tablecloths came within 3 business days. One was the wrong size, but the assistant was very helpful in sending the correct size & with return instructions for the incorrect size. Click on options drop down box for sizes. "I need better instructions on returning my table cloth (item # 17740362).Is there a shipping label to send it back? Do I use the return addressl on the box it came in to ship back. I want to order a smaller size table cloth to the church table better." Hello Lynn Stratton, you will be contacted by Customer Care regarding the return. Have a great day! Peruse our handy guide to see why, when, and how a table runner could work for you. Best Ideas for Wedding Table Linens from Overstock.com. Our guides provide customers with the best ideas for wedding table linens. How to Season Wooden Spoons Before Use from Overstock.com. Our guides provide customers with information about how to season wooden spoons before use. When you're brainstorming small dining room ideas, you don't have to sacrifice your style preferences for space. These great design tips and tricks will help you beautifully decorate your dining room without it feeling cramped. She’s the one serving the finer food, initiating conversation, and refreshing everyone’s drinks. She’s the hostess with the mostest, so treat her to a thoughtful Christmas gift that shows your appreciation. Whether the home chef in your life is an enthusiastic beginner or a practiced veteran, we'll help you find just what she needs this Christmas. You don't have to spend a fortune to decorate like a designer. Easily recreate this chic Mid-Century look with budget-friendly items that pack a style punch. From living room to bedroom, our style inspiration will help you achieve this high-end look, no matter your budget. With a simple color palette leading the way, monochromatic design lets you get creative with textures, designs, and contrast. Take a look at three different rooms where we let one color take the wheel and show you how to create a monochromatic design in your own home. Are you looking for the best drinkware gifts for this Christmas? Be sure to put a few of these top gift ideas on your shopping list. Shop our huge assortment of glasses and barware at Overstock.com. Evoke a sense of warmth and comfort combined with decorative elements in this jesGORDON farmhouse kitchen.